In histories of early photography, Louis Daguerre faithfully appears as one of the fathers of the medium. His patented process, the daguerreotype, in wide use for nearly twenty years in the early 19th century, produced so many of the images we associate with the period, including famous photographs of Abraham Lincoln, Edgar Allan Poe, Emily Dickinson, and John Brown. 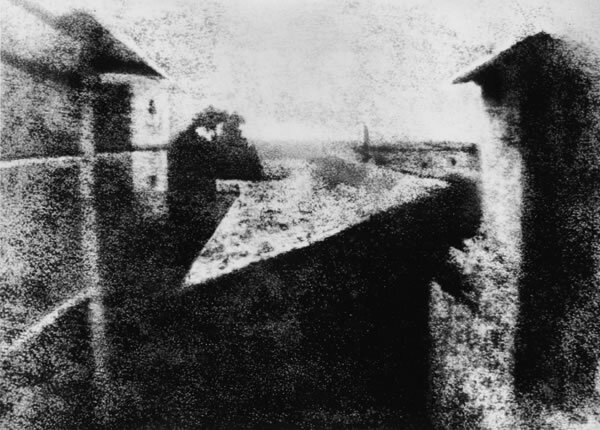 But had things gone differently, we might know better the harder-to-pronounce name of his onetime partner Joseph Nicéphore Niépce, who produced the first known photograph ever, taken in 1826. Something of a gentleman inventor, Niépce (below) began experimenting with lithography and with that ancient device, the camera obscura, in 1816. 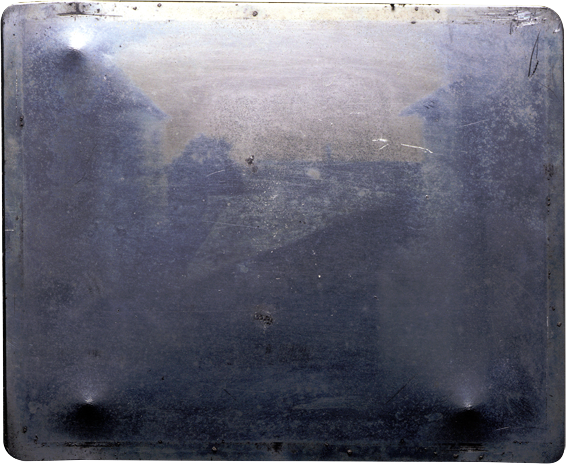 Eventually, after much trial and error, Niépce developed his own photographic process, which he called “heliography.” He began by mixing chemicals on a flat pewter plate, then placing it inside a camera. After exposing the plate to light for eight hours, the inventor then washed and dried it. What remained was the image we see above, taken, as Niépce wrote, from “the room where I work” on his country estate and now housed at the University of Texas at Austin’s Harry Ransom Center. At the Ransom Center website, you can see a short video describing Niépce’s house and showing how scholars recreated the vantage point from which he took the picture. Another video offers insight into the process Niépce invented to create his “heliograph.” In 1827, Niépce traveled to England to visit his brother. While there, with the assistance of English botanist Francis Bauer, he presented a paper on his new invention to the Royal Society. His findings were rejected, however, because he opted not to fully reveal the details, hoping to make economic gains with a proprietary method. 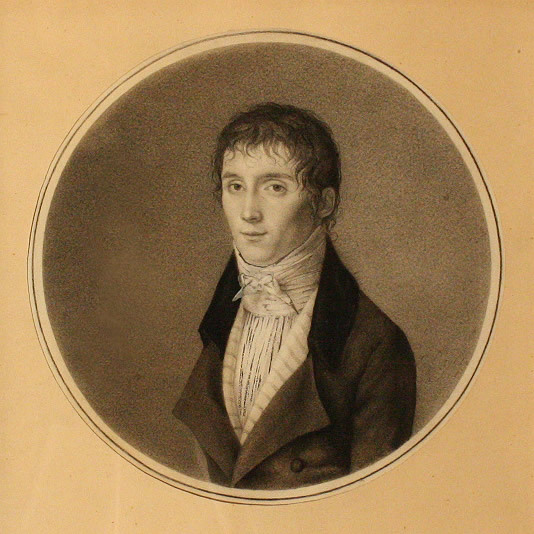 Niépce left the pewter image with Bauer and returned to France, where he shortly after agreed to a ten-year partnership with Daguerre in 1829. I once had the privilege of working at the Harry Ransome Center, in several collections, including the Photography Collection. This photo was then kept in a locked area. It was not on public display, but resided in a light and climate controlled environment. Viewing it was rather like seeing a sacred relic. Hello. It was actually the Research Laboratories at Kodak Limited in Harrow, UK, which produced the image for reproduction by the Gernsheims and not Eastman Kodak Co.